This is installment two towards infinite 3D Terrain. This is not yet "infinite". 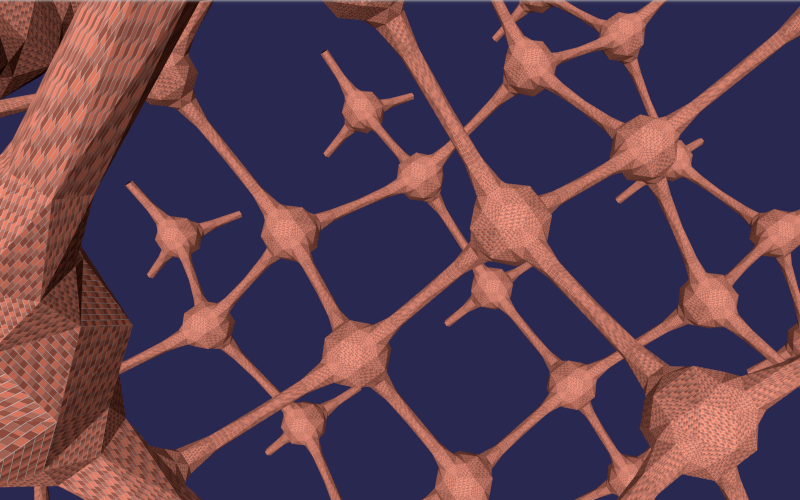 For now it's a limited 3D lattice. Go to https://www.babylonjs-playground.com/#USDWIJ#4 and make your way to an exit for an over-all view. For all the effort I've put into this, I'm now at a loss over what to do with it. Suggestions? A technique looking for an idea! My newly acquired refurbished computer has a bit more oomph than I thought! Edit: I think I'm seeing a mistake -- when viewing the labyrinth from outside, I think I'm seeing two interlaced but unconnected labyrinths. This would also apply to the PG in the OP. 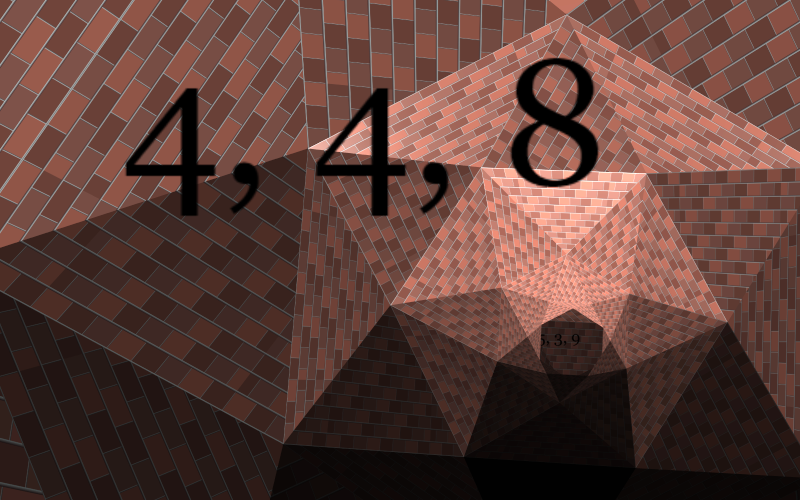 Edit 2: Fixed it by replacing lattice generator with recursive version. To INFINITY and b e y o n d ! Now the lattice develops as you approach, adding chambers ahead of you using chambers that you've left behind. Your processors only have to manage 16 total chambers instead of XxYxZ chambers for an XxYxZ sized lattice. So better frame rate and an infinity of chambers! For challenge, try to make your way to an exit -- exits are at grid coordinates that are divisible by four: [4, 4, 4], [40,-12,8], etc. Another challenge: try exit a chamber and return through a different tunnel. My goal was to make a regular labyrinth: uniform sized and spaced chambers with tunnels connected to each nearest neighbor. To avoid sight-lines that extend beyond neighboring chambers, I based the chambers on the tetrahedron. The tetrahedron has four faces, none of which are parallel. Actually, I used the truncated tetrahedron which has hexagon instead of triangle faces. I extended the hexagons to form the tunnels. Adjacent chambers are mirror images. The absolute values of the components of a vector between neighboring chambers are equal (opposite corners of a cube). [even, even, even] or [odd, odd, odd]. I woke up this AM with questions and musings about this project. Q: Are the [even, even, even], [odd, odd, odd] lattice node positions required? A: No, the lattice can be started (seeded) anywhere. The [even, even, even], [odd, odd, odd] pattern is convenient. Q: Are all [even, even, even] and [odd, odd, odd] positions occupied? Q: So exits at positions with coordinates divisible by ten might not exist? A: Possibly, 50% chance since I chose div by 10 arbitrarily. Q: How can I choose periodic exit locations that do exist? A: Don't know. Working on it. Help? (https://www.babylonjs-playground.com/#USDWIJ#2 lines 191 - 194). and changed other references to PG with non-existing exits. I'm pretty sure that the first two PGs in this topic are generating two interleaved lattices (not my intention). Anyone care to try fixing this gnarly inscrutable lattice generator?